Smoke detectors are an important part of a monitored alarm system. Smoke detector systems may be installed by your alarm company or by an electrician. Electricians install 120VAC smoke detectors, while alarm companies typically install 12VDC monitored smoke detectors. The 120VAC smoke detectors are lopped together on a single circuit, so if one smoke detector is tripped, all detectors will sound. It is not connected to a monitored system or external sirens. The power comes from your circuit breaker and the backup battery is inside each of the individual detectors. 12VDC monitored smoke detectors--installed by Urban Alarm--are connected to the alarm control panel. They are powered by the alarm panel and a single large 12VDC battery that provides backup power to the alarm panel and all the devices connected to the alarm panel. Up until recently, the 120VAC detectors were required to meet most code requirements (click here for more information on fire and electrical code). 12VDC monitored smoke detectors were not an option for code and inspections. However, effective with the International Residential Code (IRC) 2009 version, hard-wired 12VDC smoke detectors are now accepted to meet code and inspections. Unfortunately, it can take time for states and counties to catch up to the most recent code. Many, including DC and Maryland, and Virginia, are officially on older code standards, which require the 120VAC detectors. The good news is, in practice, DC, Maryland, and Virginia do allow 12VDC monitored smoke detectors to meet code and inspections. In some cases you may need a variance during the permit process, but we have found jurisdictions willing to provide these so long as the installation meets the 2009 code requirement. Fire department is dispatched in response to monitored smoke alarms. Monitored sensors are also monitored for functional health and troubles. These signals are sent to the monitoring center and the home owner is notified. If a smoke detector has a false alarm (e.g., from cooking) the monitored smokes can be re-set from the keypad rather then having to reach up to the ceiling and silencing the alarm on the sensor itself. The monitored sensors share a single backup battery at the panel so batteries do not need to be changed in each individual smoke sensor device. This simplifies maintenance and reduces likelihood of system failure. Hardwired smoke detectors have many design options. For aesthetic reasons, homeowners or architects may prefer a recessed sensor, such as the fully recessed smoke detector pictured below. It is possible to install and monitor a relay on the 120VAC smoke detector loop. 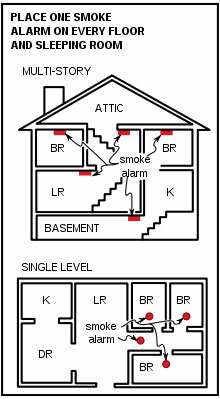 In this configuration, a trip in any of the smoke detectors will result in a fire alarm transmission to the monitoring center (and a fire department dispatch). But we will only know if a sensor goes off -- we will not know which one or why. Nor will the health of the system and device be monitored. What about Wireless Smoke Detectors? Up until the 2012 International Residential Code (IRC) was made, all low voltage smoke detectors were required to be hard-wired. The 2012 IRC code allows wireless smoke detectors, but jurisdictions are not quick to adopt this brand new standard. Over the next year, they will be reviewing code updates and the matter of wireless smoke detectors will clearly be up for discussion. Contact our office for the latest on this matter and we will update the blog as soon as we have more information. Keep in mind, the NFPA recommends replacing your smoke detectors every 5 years. Most manufacturers documentation recommend replacing detectors at least every 7 years. Smoke detectors should be tested regularly and inspected / cleaned by an alarm company annually.